Switches and Variables are tools to be used with Events and Common Events. Once created in this Editor, you can alter their values in the Event Editor. This is where you select what type of Switch or Variable you want to make. Player Switches are simple True or False values tied to each player seperately. This can be used in various situations such as if a player has unlocked that pesky dungeon door or not. Player Variables are simple integer based values tied to each player seperately. Global Switches are simple True or False values tied to the game world. If a Global Switch is turned on, it's going to be turned on for everyone. Global Variables are simple integer based values tied to the game world. If a Global Variable is set to 5, it's going to be 5 for everyone. 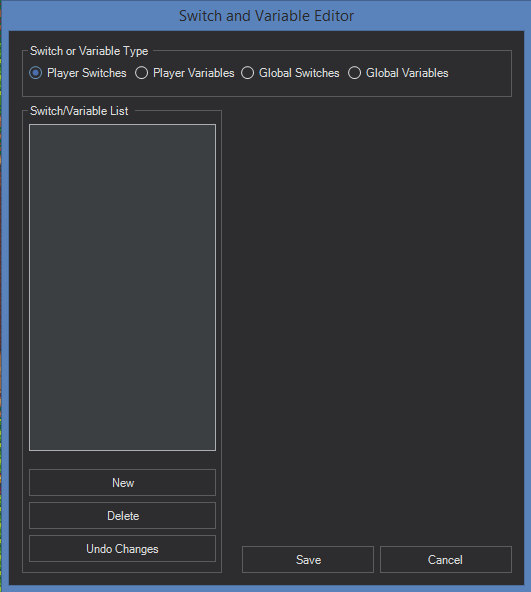 You can create a new Switch or Variable by selecting the type you wish to create and clicking New. Double clicking the Variable or Switch in your list will allow you to rename it. This helps organize your Switches and Variables.